“Mother of nine killed in hit and run crime. I bet some of you at first thought the leading paragraph in the extraction above referred to a human mother and her children. If so were you not absolutely appalled, thinking something along the lines of what is happening that people should pass by a mother and her children lying dead and dying in the road, are we becoming so callous, indifferent and inhuman? I know at first I did just for a few fleeting moments until I continued reading further and discovered the beings concerned were opossums. Yet the account is still shocking isn’t it. At least it should be. The callous indifference with which many animals are treated shocks and saddens me. The above blog entry bought tears to my eyes. Please do read the entire blog entry. It is a powerful piece of writing which brings home the dreadful state of affairs where many humans consider the life of an animal as of no value . Many people will pass by a sick or injured animal and think nothing of it, not stopping to help, not caring. The lives of all animals are important to the animal concerned, in fact their lives are as important to them as mine is to me, as yours is to you. are Trayvon Martin. It’s only been a few days since the ending of the trial of the slayer of the adolescent human namedTrayvon Martin and the reactions are still unfolding. For those of you unfamiliar with the incident, a man armed with a gun killed an unarmed adolescent. The man said he had a good reason to and initially that was going to be the end of the incident. Eventually the killer was arrested and tried and found not guilty of murder. Because apparently the jury agreed he had enough reason to justify murder. “My last post was about a mother opossum who was killed by a hit and run driver who drove on and left her body and her living children lying in the street. That’s the world our fellow Earthlings live in if they happen to encounter a human. Their life may be taken by accident, carelessness or intent and there are no sanctions or rules against it (mostly) and that’s “just the way it is”. There is no justice for them beyond what might be dealt out by their friends or their family or their companions. And that rarely happens. http://veganelder.blogspot.co.uk/2013/07/all-our-fellow-earthlings.html you will need to read the entire post to thoroughly understand the context of the above. I find the world a dark place with humans exploiting, neglecting, maiming, killing and perpetrating all sorts of injustices towards other humans, added to which the shocking horror of endless cruelty to every species of animal you can imagine. In the last fourteen years since I have had internet access the horror of man’s inhumanity towards the other beings with whom we share this world sickens me beyond my ability to adequately express. This week in my e-mail box I have e-mails alerting me to all kinds of abuse towards non human animals, petitions requesting signatures to prevent atrocities to our fellow creatures, requests to write letters and e-mails to governments, corporations, universities, places of entertainment such as zoos circuses and so on on and on and on urging them to stop some form of animal cruelty. The flow of suffering day after day for animals in factory farms, in laboratories, in zoos, as neglected pets is overwhelming. Suffering on a scale unimaginable. http://earthlings.com/?page_id=32 Warning! Contains graphic imagery which some people may find upsetting. Insects, arachnids, molluscs in this case slugs: here is an example of how the lives of tiny animals are regarded. It is all to do with difference and I believe also intelligence as even humans segregate and treat with disrespect and worse their fellow humans whose intelligence does not measure up to the accepted normal or above! I am vegan and have been so now for about four years after eighteen years of being vegetarian. I don’t kill anything on purpose including insects, spiders and slugs for example and don’t use animal products, food or otherwise . I do not put poison on our vegetables in our allotment or use fly spray or slug pellets. We remove flies from the house by using a glass and a piece of paper when they settle on the windows. I accidently kill things of course but I do my best to avoid doing so. Veganism is not only about diet, it is a way of life, at least if you are vegan for ethical reasons. As a vegan I am concerned about my fellow creatures and avoid the use of animals for food clothing or anything else – you will be surprised at how much animal derivatives are used in our day to day lives. As a vegan I avoid such whenever humanly possible. I never support the use of animals for entertainment or as use for experimentation or as pets though I have given a home to three abused and neglect rabbits. There are plenty of animals needing a home, no need to go to pet shop. Animals have their own lives, their own ways of being, they are not here for our use or abuse. We are not stewards over the earth and its inhabitants, we do not have dominion, we are just one of millions of species who live on this earth and it is time we learnt to live more amicably with our fellow creatures. Order Your FREE Vegetarian/Vegan Starter Kit! Life is life – whether in a cat, or dog or man. There is no difference there between a cat or a man. The idea of difference is a human conception for man’s own advantage. Are you fed up with the phone ringing several times each day, of being bombarded with unwanted annoying calls and text. Time for the government to take action and bring an end to this misery. Yes for many it is more than a nuisance. Several times a day my family and I receive such calls and we are ex-directory. Many people get dozens of these calls each day, every day and at any time. Please help with a campaign to bring an end to this intrusion in our lives by signing this pledge. We’re campaigning to call time on nuisance calls and texts. We want a tough new approach from Government to give people power over their personal data. We want regulators to have new powers to police and punish companies that break the rules. And we want industry to provide technical fixes to filter out unwanted calls and texts. Frankly I do not want any unsolicited calls. Until relatively recently the only calls I got were from friends or relatives. I do not even want calls from people I do business with. I don’t want the bank ringing me a 7.30 in the evening trying to sell insurance or my ISP pestering me to sign up for another eighteen months. I most certainly do not want cold calls or anyone selling PIP claims, insurance or anything else, and I certainly do not want phone calls from banks asking me to take part in a survey. My family and I like most people nowadays have an answering machine with our land-line and get friends and relatives and anyone else were happy to talk with on the phone to leave a message. Mostly when the person does so you can pick up the phone if it is someone you to want talk with. You may find as we did that if you ignore them these phone calls get less over time. Yes there maybe times when his is not a good idea, if you ‘re expecting an important call or if you are running a business from home, you have to play it by ear of course. It’s not a good idea for everyone and some people may worry should someone need them urgently. I don’t have my mobile phone turned on as I use it is only in emergency or on the odd occasion when necessary and I have never received a call or a text so know nothing about how this works with mobile phones. this page includes a link about how to deal with spam text messages and more. Sounds like a lot of work and we should not have to take all these actions. It’s time the government put a stop to nuisance calls & texts but unless we pressure them to do so I rather think little will change. Personally, I am sick and tired of being pestered and bombarded with advertising, on TV, on the net, spam, e-mail, junk mail but when you are constantly interrupted by intrusive calls it is plain and simply not acceptable and it is high time the government did something about it. It seems that no one has any standards of ethics or decency any more. Even solicitors are touting for business in shopping centres anything from funeral plans -really how tacky – to injury claims and so on. All the time you are pestered. You cannot call your bank to make an inquiry without being pressured to sign up for their insurance cover on the phone, now I ask you who with any sense is going to make a snap decision over the phone? Not me that’s for sure. How things have changed in my life-time and it is getting worse. The more we allow such things to happen the longer they continue until they’ re so common place people accept it as normal. You should not have to put up with dozens of phone calls all day long, it’s a nuisance, an inconvenience and plan and simply wrong. Dalai Lama , My Land and My People. Please sign two petitions concerning the Chinese occupation of Tibet . A Tibetan monk was shot in the head and around six others received gunshot wounds last Saturday when Chinese security forces opened fire on Tibetans who were trying to mark the Dalai Lama’s birthday. Several hundred people from Tawu, including monks and nuns, gathered on the sacred Machen Pomra mountain, to offer prayers; as they do every year. Chinese security forces were waiting for them. The Tibetans were prevented from reaching the incense offering stage on the top. Many turned back and went to another part of the mountain to offer prayers; as they had been forced to do last year. At some point, security forces fired at the unarmed crowd. It is still unclear why. At least two people were critically injured including Tashi Sonam, a monk from Nyatso monastery, who was shot in the head. He is currently in hospital. Tear gas and rubber bullets were also fired into the crowd, injuring several others. Among the injured was Jangchup Dorjee (pictured), a monk and brother of Palden Choetso, a nun who set herself on fire in November 2011. On the night of 6 July, 17 people were reportedly arrested. The abbot of Nyatso monastery and other senior monks went to the detention centre to appeal for the release of the individuals who had been detained. It seems that the authorities released those who had been arrested. This latest incident is part of the Chinese government’s increasing efforts to crush Tibet and Tibetan culture. These policies fuel Tibetans’ anger and create a cycle of protest and further oppression. Despite the lack of international support the people of Tibet continue to hope that one day they will be free from the tyranny of Chinese rule. Often so little is reported in the mainstream media, but make no mistake the struggle for a free Tibet continues. The most recent incident we know about concerns the shooting of a gathering of monks mentioned above. On 6th July the exiled leader of Tibet the Dalai Lama celebrated is 78 birthday. It was while celebrating this ceremony that Tibetan monks were shot by police as they gathered at a sacred mountain in an area of south-western occupied Tibet. The second petition concerns the opening of a hotel in Lhasa the capital of Tibet by the Intercontinental Hotel chain. The Hotel chain is the largest in the world with profits of over £400,000 000 for the last year. To open this hotel for the sole purpose of profit in an occupied country is outrageously unethical to the extreme. To support the regime of a suppressive and brutal occupation can be described in no other way. The Tibetan people will not receive any benefit whatsoever. Join the boycot by sending a message to Richard Solomons, IHG chief executive, today. “Intercontinental Hotels Group plans to open a new 1,000+ room luxury hotel in Lhasa next year; the Intercontinental Resort Lhasa Paradise. Lhasa is not a playground for the rich: it is the beleaguered capital of an oppressed and occupied nation. The presence of an upscale multinational brand such as Intercontinental gifts priceless PR to the Chinese regime which is responsible for gross human rights abuses throughout Tibet. IHG’s marketing portrays Lhasa as a paradise and trades on images of an ancient Tibetan culture which in reality is being systematically destroyed by China. More than 90% of visitors to Tibet are Chinese. The hotel’s rooms will be occupied by wealthy Chinese friends of the Communist regime or by its highly paid or highly bribed officials: its business facilities will depend on use by the regime and its cronies. At worst, this hotel could be where the further oppression of the Tibetan people is actually facilitated. IHG and China will take the profit: Tibetans will wash the dishes. Please take action to bring an end to neglect and abuse of the UK’s third most popular pet. Rabbits desperately need help. Radical changes are needed to ensure their welfare. Rabbits are sensitive and intelligent creatures, it is time they were treated with respect and accorded the same protections as cats and dogs. Like you or I and all animals rabbits suffer pain, stress, and depression. Sadly the usual outcome for many rabbits is abandonment at the bottom of someone’s garden after the novelty has worm off, consigned for a life time to live alone in a cramped hutch suffering from untreated conditions, often dying in pain that could be prevented. As bizarre as it may seem to those of us who care for animals , all animals, many people consider that rabbits do not need veterinary care and many rabbits end up dying in pain and living miserable wretched lives. A neighbour of mine actually said you don’t take rabbits to the vet. Why Not! Are they immune to disease, pain and death? Of course not they are mammals just like a cat or a dog, just like you in fact. The fact is rabbits have delicate health and complex care needs. They say that ignorance is bliss but for rabbits the ignorance of owners concerning the needs of their pet is anything but bliss for the unfortunate rabbit. 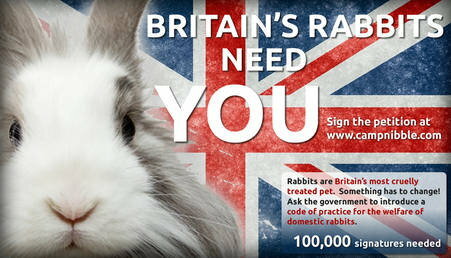 As a nation of so called animal lover’s the way many people treat their rabbits is shocking. Really ignorance is no excuse these days with information so readily available. As for deliberate abuse this is never acceptable behaviour towards any animal and people need to be taken to account and punished for abusing a rabbit as they do for a cat or dog. It is time for the government to tighten up on rabbit welfare and provide better protection for rabbits. Please now click the link below and sign the petitions if you have not done so.